I remember when National Geographic was a Gold Standard of writing. Remember, dear readers - it's feelings not facts that matter. 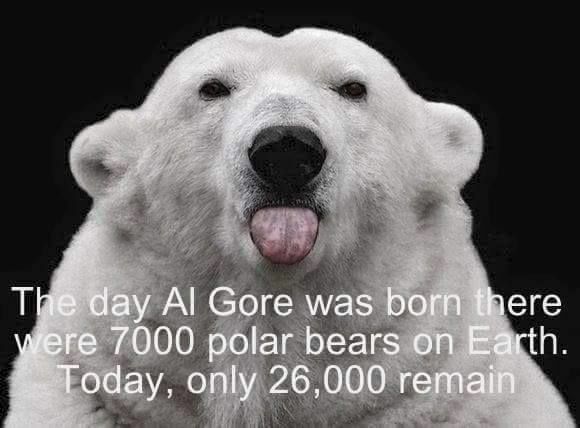 2) Now let's hear what someone who actually knows about Polar Bears thinks of the situation. When Leo Ikakhik saw this weekend's viral video of an emaciated polar bear rummaging through the garbage in search of food, he wasn't shocked. "I wasn't totally surprised. These things happen," the Nunavut polar bear monitor told As It Happens host Carol Off. "Mother Nature is going to do part of that. You know, it's just part of the cycle." Ikakhik has been monitoring polar bear activity in and around Arviat, a small community on the western shore of Hudson Bay, since 2010, working with organizations like the World Wildlife Fund Canada to keep the creatures away from human populations and reduce polar bear deaths. "Everybody probably was shocked to see a really skinny bear, but this is not my first time seeing something like this." Instead, he suspects the creature was likely sick or recovering from an old injury that left it unable to hunt. He said he sees healthy and well-fed polar bears in the Arctic all the time, but some are simply unlucky. "I remember when National Geographic was a Gold Standard of writing..."
The new generation of Snowflakes and bleeding hearts have taken over. Almost every farking nature show nowadays have some mention of "global warming". Must be mandatory else they lose funding of some sort. Am I just bad? Every time I see something like this I look for ways to create more gobble warming. I know nothing I do will matter one way or another as man is insignificant compared to the earth and mother nature. God controls all.